Short of maybe Die Hard, Home Alone is the one Christmas movie that I am guaranteed to stop and watch every year when it makes its way around the basic cable circuit. There’s nothing more heartwarming than the tale of a young lad defending his house from a pair of convicted felons because of his parents’ borderline criminal negligence through a combination of resourcefulness and the incredible incompetence of the robbers. Of course, kids loved the movie, and therefore, there needed to be a video game based on it, that’s just simple logic. 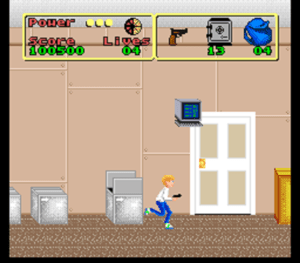 Unfortunately, game designers may have gone a tinge overboard with the license, though, as there were a jillion different versions of Home Alone cranked out over pretty much every conceivable system. Today, though, let’s take a look at the Super Nintendo version, released in ’91, in the infancy of the SNES’s existence. 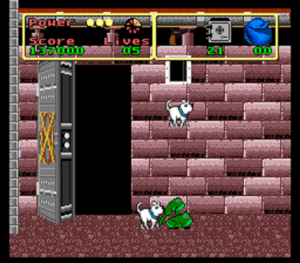 Unlike the Genesis or the DOS versions of Home Alone, the Super Nintendo iteration doesn’t focus as much on the cat-and-mouse battle between Kevin and the Wet Bandits. 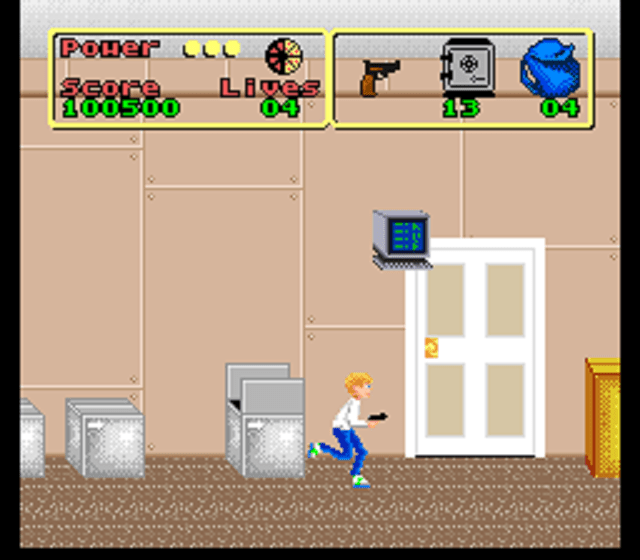 Instead, it’s more of a loot-your-own-house simulator, as your primary objective is to grab valuables sprinkled around the house and stash them down laundry chutes into the basement for safekeeping in the giant bank vault that I definitely don’t remember in the movie. 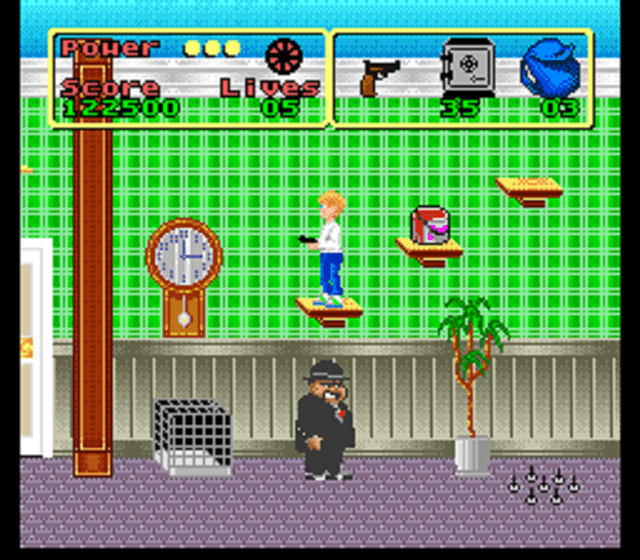 There are four levels, representing different wings of the house and with different types of objects to snag; the first level has you going after jewels and bags of money and such, the second level has you rounding up toys, the third wing features spectacularly ’90s electronics like VCRs that blink “12:00” and old-timey big beige computers, and the fourth stage is a race for the family’s pets. 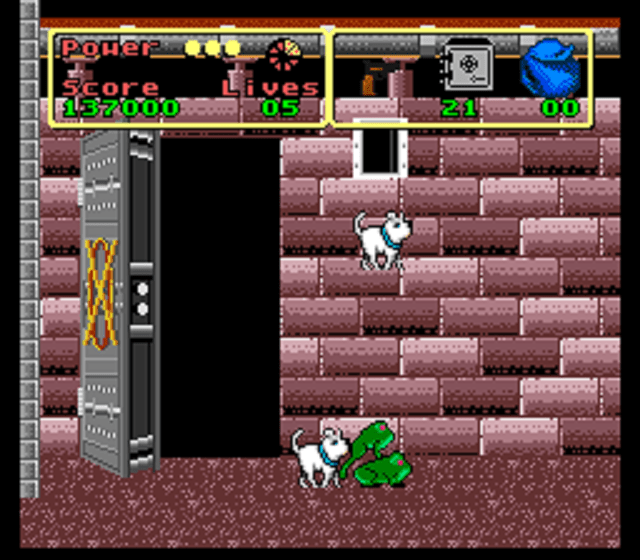 After you’ve stashed a certain number of items down the chute, you go down to a basement level, dodging various enemies like rats, ghosts, and giant cockroaches, usually culminating on a boss fight against a bigger version of them. 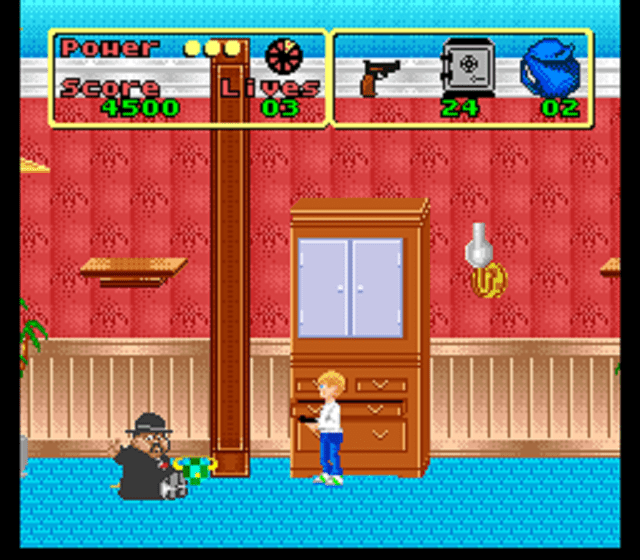 Now, even though the game isn’t necessarily focused on holding off the Wet Bandits, they do make sporadic appearances throughout the levels, alongside some generic baddies like “1920s Gangster Suit Guy” and “Guy in a White Hat That Throws His Hat At You”. You do have some limited defensive capabilities, starting with a water pistol that can stun enemies long enough for you to hop over them, and eventually adding on a slingshot, thrown baseballs, and Kevin’s BB gun that can actually take enemies out. No pets were harmed in the making of this review. Thankfully, though, there are a couple of set-piece spots that are more in the spirit of the movie’s antics, like knocking a paint can down from a high ledge onto a bad guy’s head or luring them into a banana peel that takes them out, and although these are pretty basic and unspectacular for the most part, it’s still somewhat satisfying to drop a trophy on a bad guy’s head and scoop up the trophy afterwards. There’s also a handful of other collectibles, like cookies that restore health, pizza slices that give you an extra life if you grab eight, and yes, picking up a bottle of aftershave will make you run around like a chicken with its head cut off, but it also makes you temporarily invincible and capable of plowing through enemies like a hot knife through butter. You shouldn’t have much of a problem getting around, either, as the play control here is pretty solid for the most part. There aren’t really any precision jumps to be made, there aren’t any bottomless pits, and while Kevin does have some momentum to him, it’s not overly slippery, and he can get enough height on jumps to clear stunned enemies without having to be pixel precise at takeoff. The only thing that really did feel wonky to me was that B fires your weapon and A jumps, which I suppose shows exactly how early this game came out, that it doesn’t even utilize the “Y attacks, B jumps” system that Super Mario World more or less standardized, but uses the NES system instead. It’s not a game-breaker by any stretch, but it is a little weird for the first couple minutes. I did definitely get the impression that the developers here wanted to utilize all the new capabilities the Super Nintendo provided over the original NES, although they weren’t entirely sure how to do that. Character sprites are fairly well-detailed and are colorful, as are a lot of the backgrounds and the collectible items, but at times, it definitely walks the line between bright and colorful and garish. Animations like Kevin’s run cycle look pretty good, but dispatching an enemy makes them turn into a static image and fall off the screen with an accompanying sound that sounds like somebody puking. 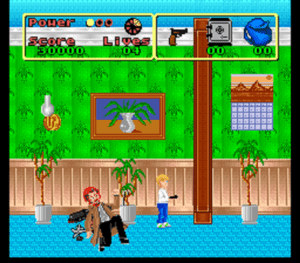 There are little snippets of cutscenes between each stage with a badly-rendered version of Macaulay Culkin that you kinda have to squint at to make out, and yet, weirdly enough, if you lose a life, you get a much better rendition of him, although you’d be well-advised to avoid it, because I can best describe it as horrifying. The background music isn’t bad, all the themes seem fairly appropriate for the Christmas time setting, and while they’re not the same quality as you’d expect from games later on in the Super Nintendo’s lifespan, they aren’t bad, if a little bloopy. I have to point out, though, that this game does feature one of the most anticlimactic finishes I’ve encountered in quite a while. While I can understand not making the bulk of the game a showdown between Kevin and the Wet Bandits, and just tossing them in there every now and then, you would think that if that was the case, it would mean the game was building up to a big final showdown with Harry and Marv, maybe something where you end up getting an assist from the creepy next door neighbor with the snow shovel like in the movie. It doesn’t. And I don’t mean it doesn’t end with an assist from the creepy neighbor, it doesn’t end in an epic boss fight against the Wet Bandits. At all. The last boss is a giant rat you end up knocking bricks onto, and then Catherine O’Hara shows up out of nowhere and the Wet Bandits are magically in jail. That is some extremely weak sauce right there. Y’see kids, computers used to look a LOT different. 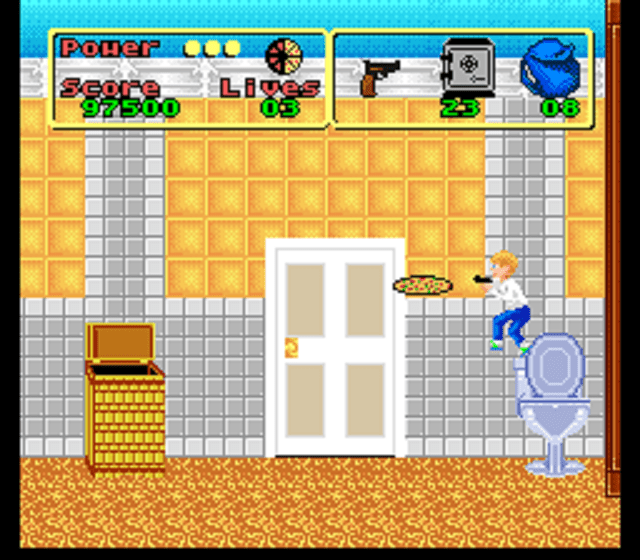 Overall, Home Alone for Super Nintendo is an acceptable, if unspectacular, little action game. There’s not a lot of staying power to it, you can rip through it in about an hour or so, and the final boss is disappointing as all get out, but what’s here is fine. 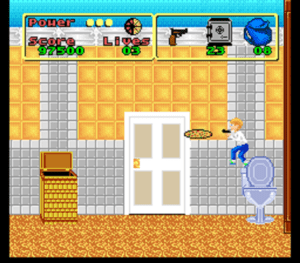 The developers went in a somewhat different direction than most of the other versions, but it manages to not detract too much from the gameplay, and there are moments where it does have that Home Alone feel, dropping heavy objects on enemies and using kids’ toys as makeshift weaponry. It’s definitely bright and sunny to look at, and pleasant enough to listen to, although as I said, I felt the designers were attempting to show off the Super Nintendo’s capabilities with no real template to work from to do so, seeing as this came out less than a year after the Super NES was released itself. I don’t know if I’d recommend it, per se, but I don’t have much reason to tell you to steer clear of it, so I suppose that puts it right in the middle, a perfectly average game, but if you’re looking to finally give Harry and Marv their proper comeuppance, you’ll have to wait for the sequel. Not a bad spin on the Home Alone formula, very “kid-friendly” presentation, and some simple traps give a taste of what made the movie fun. Extremely short, and not having a boss battle with the Wet Bandits themselves is INCREDIBLY disappointing. Had this for the Game Boy (and Home Alone 2), don’t believe I ever finished either. Most of what I remember was hammering “Up” religiously to search everything in the background for valuables. Some were hidden up high, behind paintings, and just generally you’d have to jump around and maybe a watch would magically fly out. Couldn’t beat the level until you found everything. 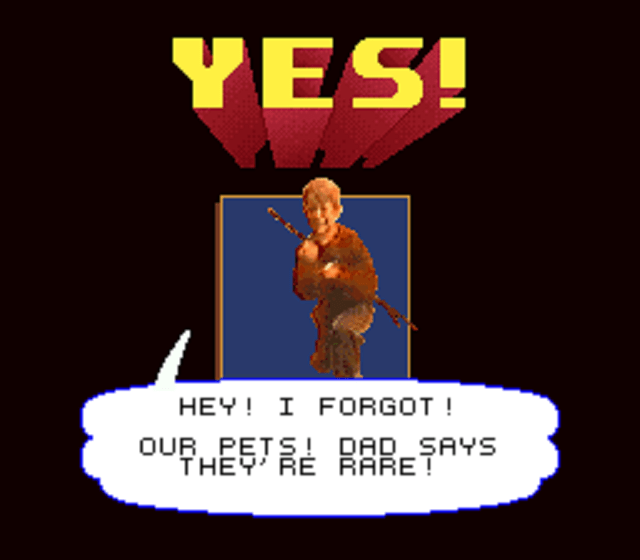 Was that a GB limitation, or did they have you searching around for hidden treasure here too? Yup! You have to jump around like a maniac to find hidden items here too. And I had the Game Boy version, also, and I will say at least the Game Boy version had a somewhat satisfying final boss fight. Yeah, I can agree with 2 and a half stars. I still can’t believe this was made by THQ. 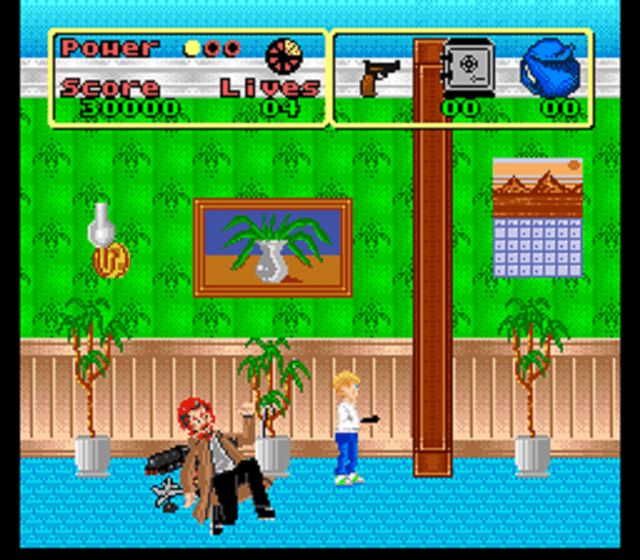 In all honesty, the game isn’t that bad but it certainly isn’t a great Home Alone game in any respect. On our channel, we had a playthrough of it but even before that I had heard horror stories of it but seeing is believing. The only real thing I can say about this game is that it had some rather novel ways to achieve goals. Such as using a background dresser drawer and pulling it into the foreground making it into a step to reach another “valuable” toy to save. That wasn’t done much in games back then so it was surprising to see that level of innovation.